Known affectionately by its residents as 'Indy', the city of Indianapolis is the capital of the US state of Indiana (IN) and is America's 12th largest city. Lying in Marion County, Indianapolis is best known for its speedway motor racing and the Indianapolis 500, the oldest car race in the world attracting literally hundreds of thousands of visitors each year. 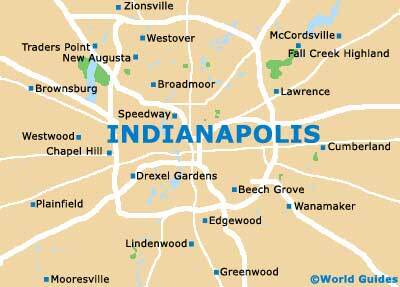 Founded in 1821, Indianapolis has grown dramatically and in 1910, was home to more than 60 major car manufacturers. Now one of the world's largest cities, Indianapolis contains many interesting and historic districts, which are well worth exploring, with Victorian architecture, cobblestone streets, interesting local shops and popular restaurants. 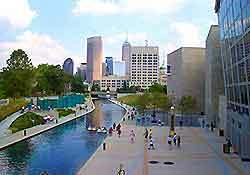 Much of the city has been extensively redeveloped over recent years, particularly downtown Indianapolis. There are plenty of affordable hotels throughout Indianapolis, many of which are located in the city center, along North Michigan Road, North West Street, River Crossing, South Illinois Street, around Jackson Place and close to nearby highways. Representing all levels of lodging and budgets, hotel rooms in Indianapolis should always be reserved prior to your arrivals. Further hotels are also situated close to Indianapolis International Airport (IND), which is just 7 miles / 11 km from central Indianapolis. 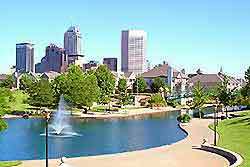 More information about Indianapolis Hotels. Tourism is now an integral part of life in Indianapolis and the city's main tourism outlet is the Indianapolis Convention and Visitors Association, which is located along at One RCA Dome. Full of helpful tourism information about sightseeing opportunities and excursions throughout Indianapolis, the tourist information outlet provides an array of travel brochures about local tourist attractions and tourism in many of Indianapolis's neighborhoods, including Broad Ripple Village, Downtown Indianapolis, Fountain Square, Indiana Avenue, Mass Avenue, the Old Northside Historic District. Indianapolis has numerous impressive tourist attractions, such as the Indianapolis Motor Speedway - one of the city's premier attractions, hosting a range of motor racing events, including the Indianapolis 500 each May; Indianapolis Raceway Park - with more than 60 racing events and car shows each year; Greatimes Family Fun Park - popular with children and those young at heart, with many indoor activities and attractions; and Indianapolis Zoo - housing more than 2,000 animals from every continent, attracting over one million visitors every year. Other notable tourist attractions in Indianapolis include the Huddleston Farmhouse - on the eastern side of Indianapolis, with information about early migration and settlement; Morris-Butler House - a three-floor Victorian mansion, now home to an array of paintings, sculptures, tapestries and period antiques; President Benjamin Harrison Home - former residence of America's 23rd president, with information about his life, including exhibits and artifacts; the Soldiers and Sailors Monument - a 284-foot / 87-meter limestone structure, built in 1902; White River State Park - regarded as one of Indiana's finest parks, standing in the very heart of downtown Indianapolis; and Garfield Park - the oldest park in Indianapolis, dating back to 1889, known for its conservatory, sunken garden and recreational activities. 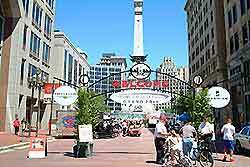 More information about Indianapolis Tourist Attractions and Indianapolis Landmarks. Some of the main museums and art galleries in Indianapolis include Children's Museum of Indianapolis - one of the largest museums of its kind in the whole world, with dinosaur fossils, archaeological exhibits and numerous hands-on displays; the Indianapolis 500 Hall of Fame Museum - located at the Indianapolis Motor Speedway, featuring more than 75 classic racing cars; the Eiteljorg Museum of American Indians and Western Art - housing a vast collection of Native American and Western works of art; the Indiana State Museum - dedicated to the preservation of culture in the Indiana area, with historical and enjoyable exhibits and information; the Indianapolis Museum of Art - containing a range of artworks by both native and international artists; and the Indianapolis Art Center - a non-profit facility with many exhibitions, actively promoting local artists. More information about Indianapolis Museums and Indianapolis Art Galleries. Tourist attractions close to Indianapolis include the Conner Prairie Pioneer Settlement - a restored 19th-century village close to Indianapolis, regarded as a living history museum; the Indiana Basketball Hall of Fame Museum - with information and historic memorabilia about Indiana's greatest basketball heroes; the James Whitcomb Riley Old Home and Museum - once the home of James Whitcomb, the famous 19th-century Hoosier poet; the Museum of Miniature Houses - with a large selection of detailed model homes and antique doll houses; the Seiberling Mansion - a neo-Jacobean and Romanesque building, former residence of Monroe Seiberling, founder of the Diamond Plate Glass Company; and the Indiana Transportation Museum - close to Indianapolis, celebrating the history of the Indiana railroad. More information about Indianapolis Attractions Nearby.